Although it may be hard for those of us living in the 21st century to believe, human hair was a greatly desired art material for the Victorians. Hair could be acquired from one’s own hairbrush, or small locks of hair might be gifted from friends and family members. 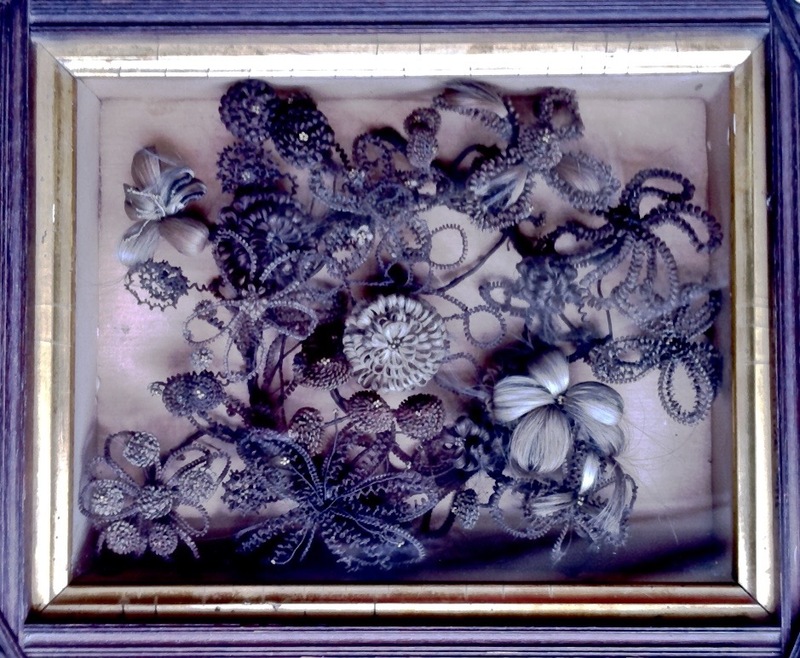 Hair was used to make jewelry, such as watch fobs, pendants, rings, and brooches, or it could be wire woven into hair wreath decorations for the home. The art of hair work was a growing trend during the mid-19th century and many jewelers contracted with hair artists to meet the increasing demand. Instruction books were printed for those interested in DIY crafting, and, eventually, a number of mail order companies sprang up to accommodate those less artistically inclined. Competition was often fierce among these companies and those with too fast of a delivery time might be accused of substituting cheaply obtained hair for the customer’s treasured locks. In a 1908 catalogue, Sears issued a disclaimer stating that hair services were contracted out and the company could not guarantee the authenticity of the hair used, which suggests there was some truth to the accusations. Over the following years, journalists published shocking exposés about the real origins of mail-order hair art, which ranged from European peasants to the unclaimed deceased, and the popularity of the craft waned. Strangely enough, hair art has enjoyed a small revival on the Internet in recent decades, and those wishing to view an example of this curious and fascinating art medium can do so for free at Magevney House this summer.